Sun Bingo has whipped up a feast of sunny treats for you, and is all set to shower you with it's Springtacular delights! Seriously, Sun Bingo is bursting full with prizes! And prizes like these don't come around often! You could win family trip to Orlando or Dubai, a £1000 Lifestyle Shopping Voucher, a Warner Bros Studio Tour and more! 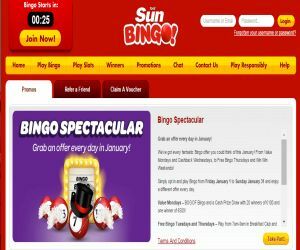 Sun Bingo ready and waiting to spice up your Spring with it's Springtacular daily prizes! So, every day between Monday April 18 and Saturday May 7, make sure you log in and grab the chance to enter Sun Bingo's fabulous Daily Prize Draw. All you have to do is top up your account during the promotion with at least £10 for Bingo, £30 on Slots or Slots Mini Games or add £50 to play your fave Casino games. You'll then instantly receive your automatic entry to the daily prize draw! Since the prizes are so spectacular, you can only earn one prize draw ticket per day and up to 20 throughout the promotion. But you'll still have plenty of chances to win with Sun Bingo! There are plenty of juicy daily prizes just waiting for you to uncover! You can check out some of these below!